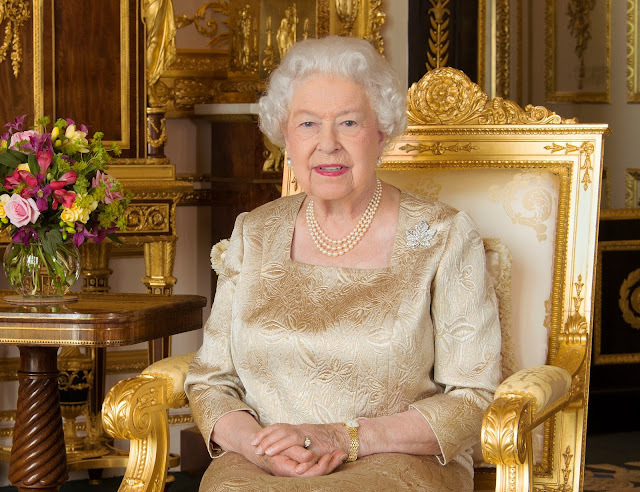 A new portrait of The Queen has been released to mark the 150th anniversary of Canada's confederation, as well as The Prince of Wales and The Duchess of Cornwall's current Canadian tour and Canada Day. In the portrait by Canadian photographer Ian Leslie Macdonald, Her Majesty is pictured wearing the Canadian maple leaf brooch she inherited from her mother in 2002. The brooch, which is made of platinum and set with diamonds, was given to Queen Elizabeth The Queen Mother by her husband, King George VI, and was worn for the first time during the Royal couple’s visit to Canada in 1939. Over the years, the brooch was loaned to Princess Elizabeth (1951), The Duchess of Cornwall (2009) and The Duchess of Cambridge (2011) during their first visits to Canada. Just like Her Majesty's December message for the confederation anniversary, the diamond Maple Leaf Brooch was the obvious choice. She is otherwise wearing her standard set of day jewels, although the usual gold watch she wears - which was a gift to her on her first Canadian tour in 1951 - does take on a bit of extra meaning on this occasion. The Maple Leaf Brooch does blend in an awful lot on this gold background, which is unfortunate. But all that gold certainly does make for a seriously regal picture.